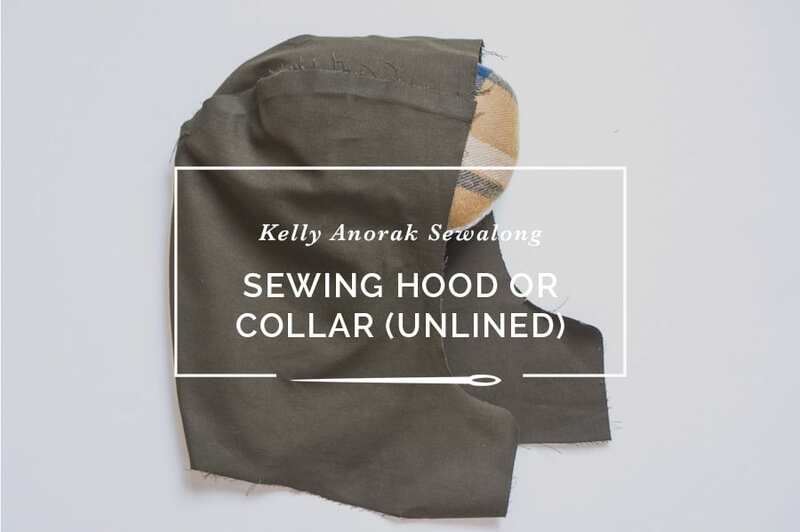 In this post we’ll show you how to assemble and attach either the three-piece hood or stand-up collar for the unlined version of our Kelly Anorak pattern. 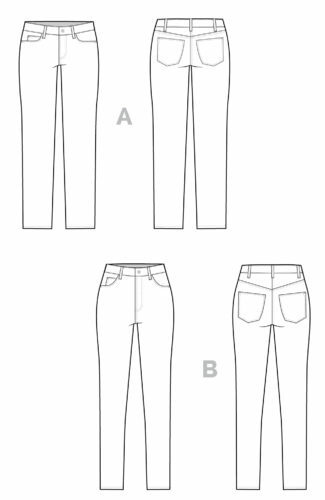 If you are sewing the lined version of Kelly, these construction steps are covered in our post on assembling the jacket lining. 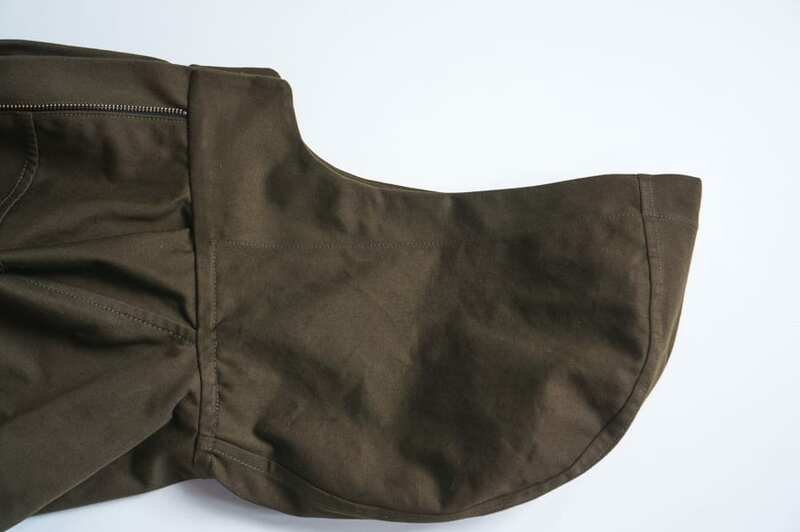 After assembling the jacket body and installing the zipper placket, you are ready to install the hood or collar. 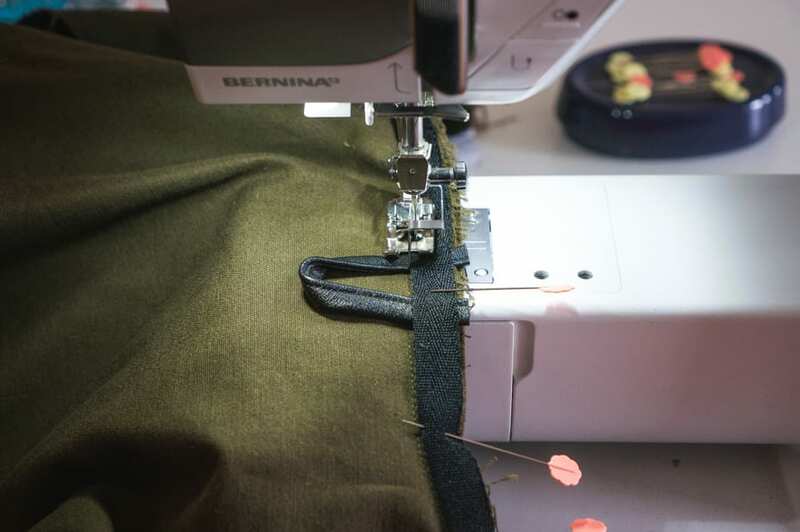 Start by stay-stitching just inside the seam allowance all around the neckline of your jacket. 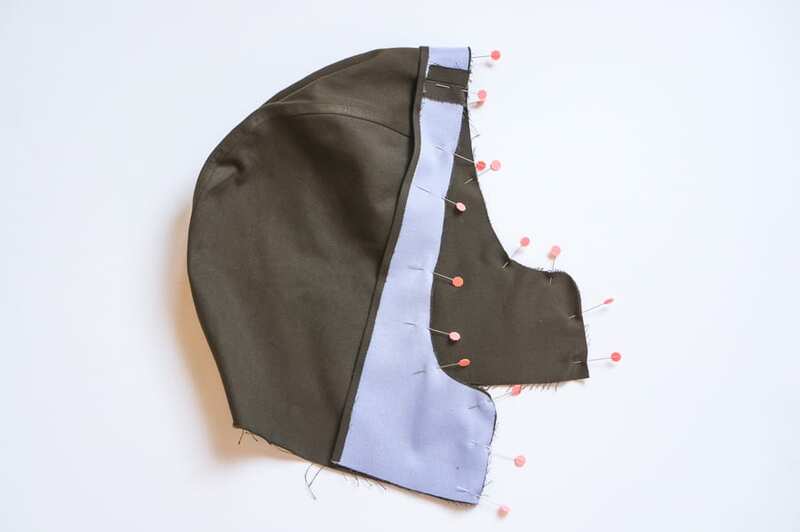 This step is helpful to ensure the neckline doesn’t stretch out too much when you set in either your hood or collar. 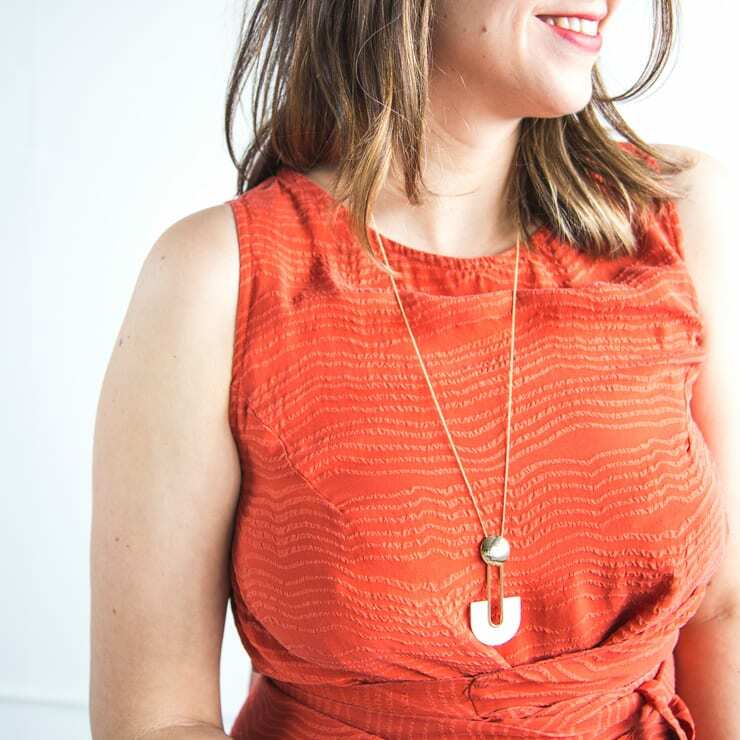 We’ll show you how to sew and install the collar for View B first. 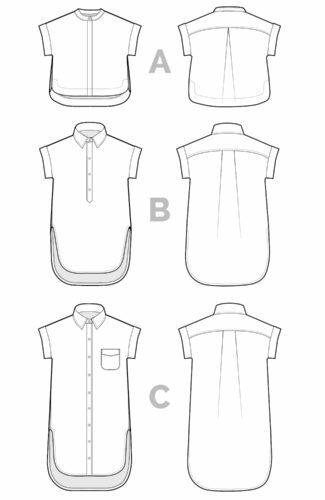 You should have two collar pieces, and one should be interfaced. The interfaced piece will be your outer collar. 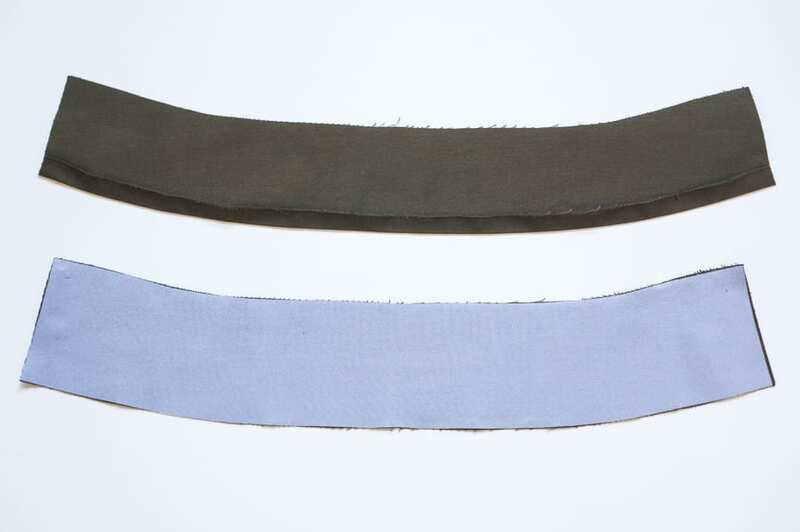 Press the longer bottom edge of the non-interfaced collar piece in by 5/8″. 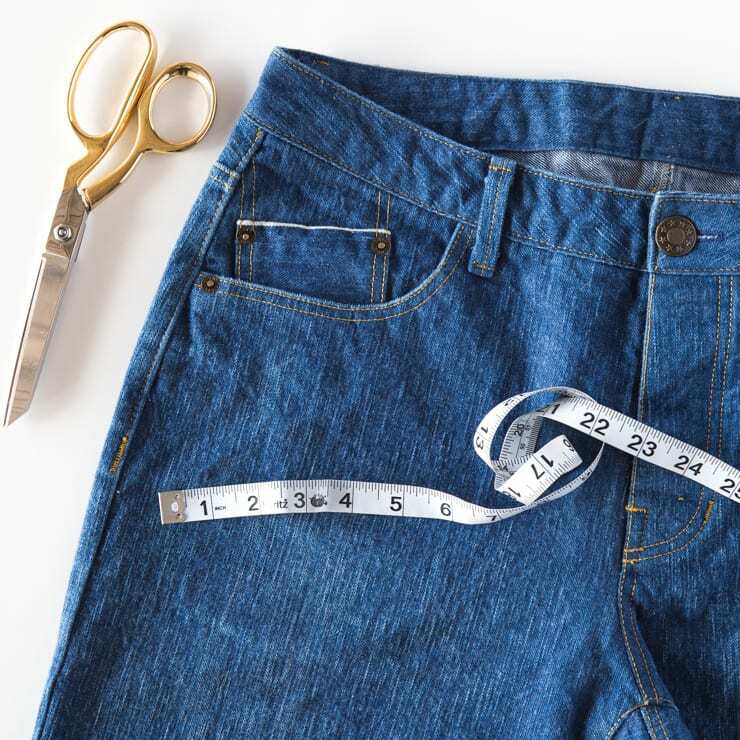 Align the two pieces right sides together and sew along the sides and top at 5/8″. 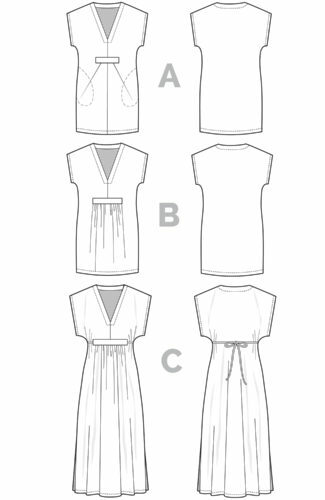 For our collar, we used the “thread tail method” covered in our tutorial on how to sew sharp collar points for our Kalle Shirtdress pattern, but this is an optional additional step; sew normally and use a point turner if you’re not feeling ambitious. Grade the seams and trim the corners of your collar, being careful not to cut too close to your stitch line. 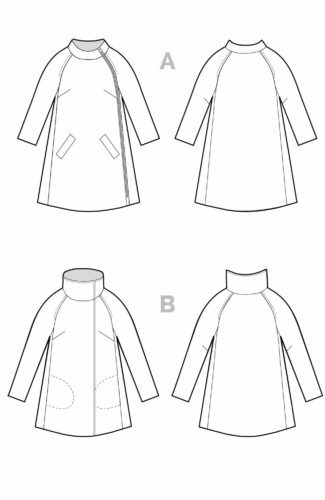 Pin the interfaced outer collar to the neckline of the jacket with right sides together. 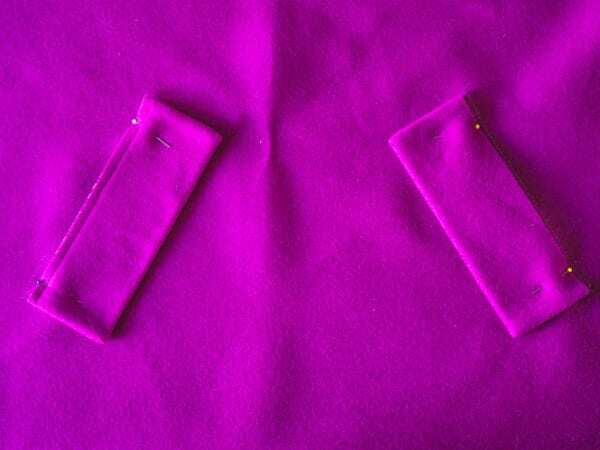 The stitch line of the collar on either side should match up with the finished edges of the jacket. 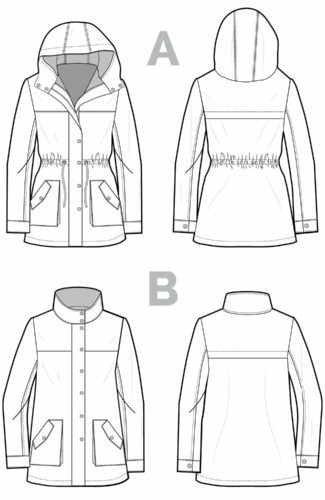 You can clip or notch the neckline of the jacket if necessary to ease the collar in. 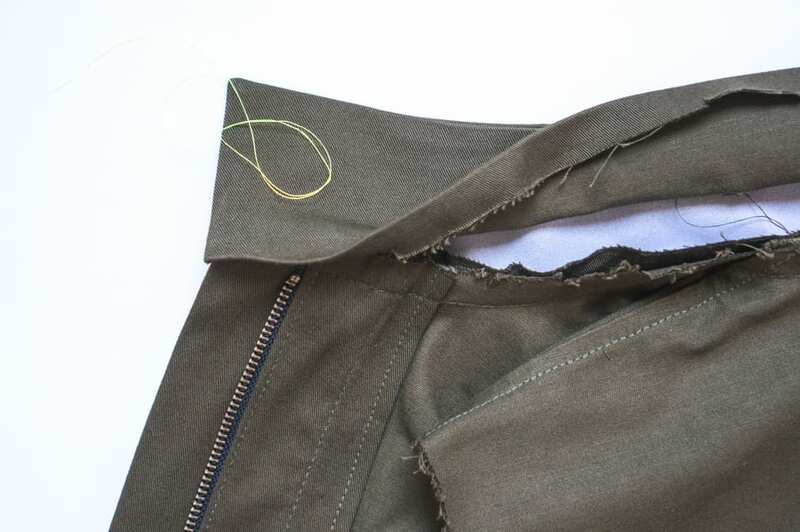 Just be careful not to cut past the stay-stitching line you sewed earlier! This is what your pinned collar should look like from the wrong side of the jacket body. 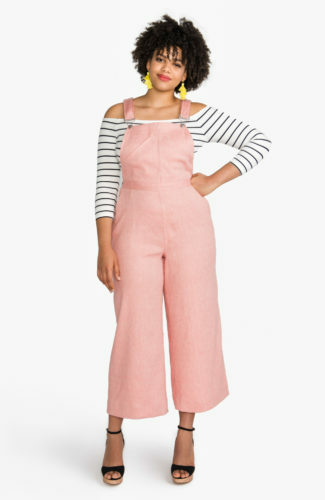 Notice the seam allowance extends past the edge of the zipper placket. 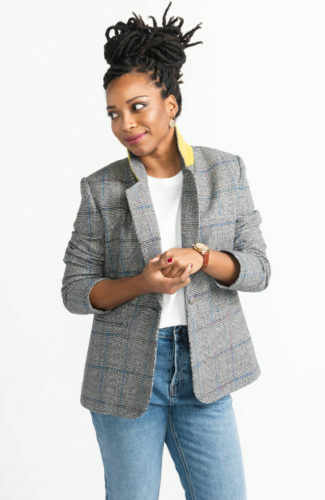 Sew the collar to the jacket, then turn your collar right side out. 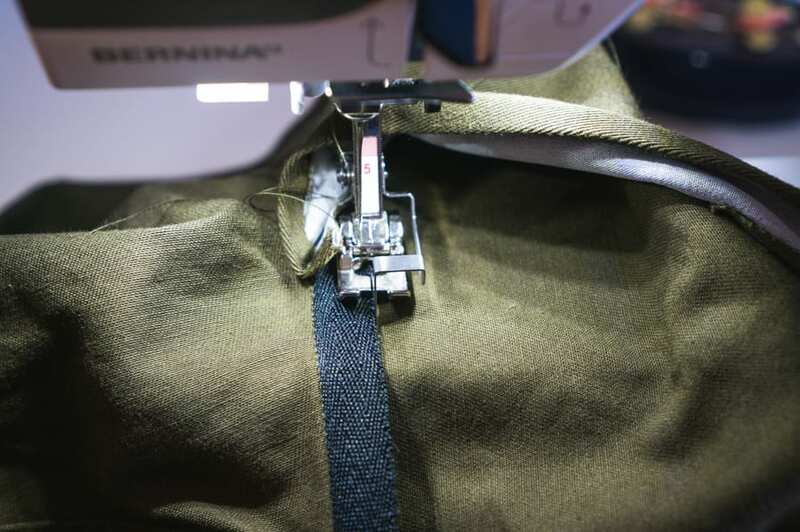 Press the seam allowance up towards the collar and grade. Use a point turner to make sharp, crisp collar corners. Here we used the thread-tail method we mentioned earlier. 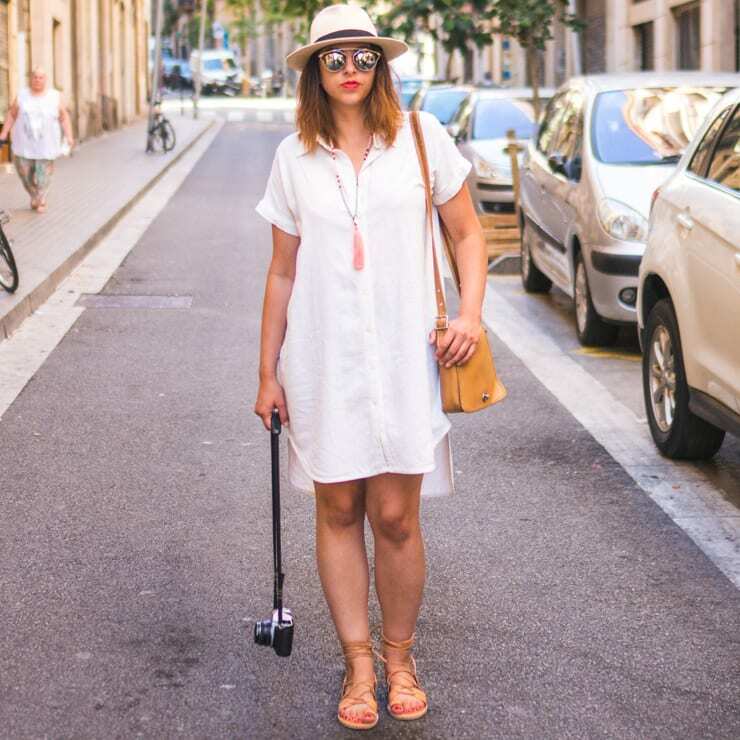 Give the collar a good press and slip stitch the inner collar to the neckline. The fold you pressed along the bottom of the inner collar earlier should help conceal the neckline seam perfectly. 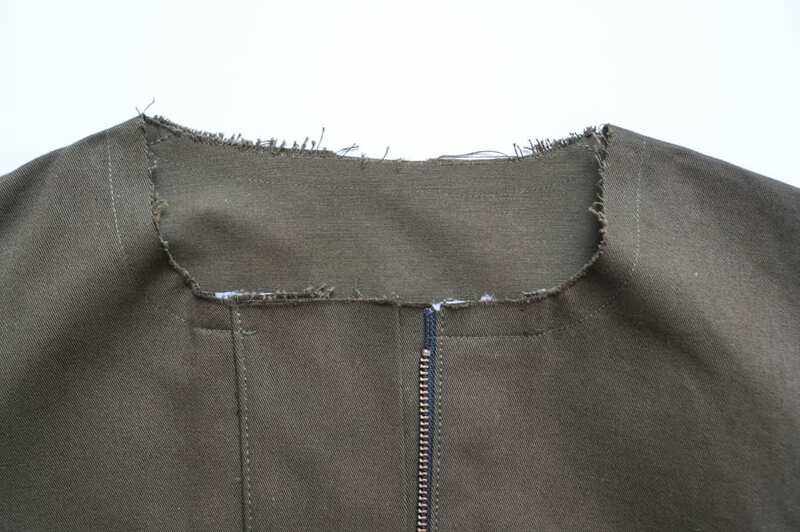 To finish, topstitch around the entire collar at 1/8″. Now we’ll show you how to sew the hood for View A. With right sides together and matching notches, pin the center hood to one of the side hood pieces. The wider part of the center hood piece should be positioned at the front of the hood where it will eventually frame your face. You will find you’ll have to ease the center hood panel to the side hood, especially if your fabric is very thick or stiff. 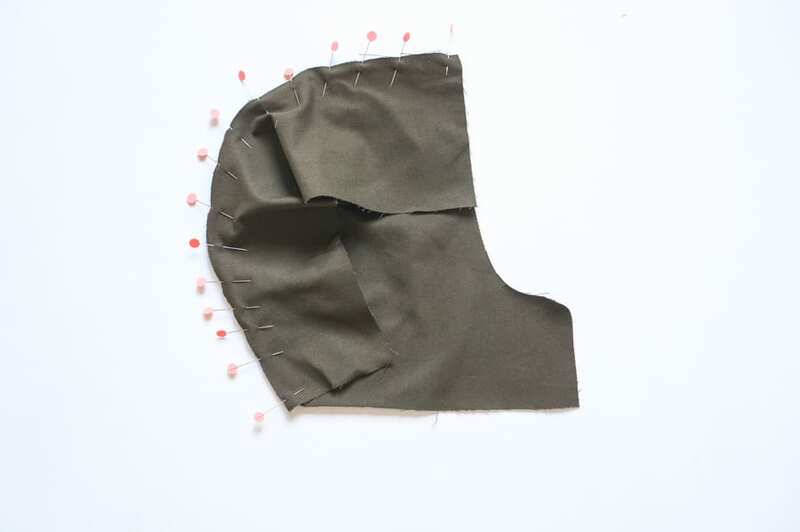 Stitch and press your seam towards the center hood. Repeat for the other side of the hood. 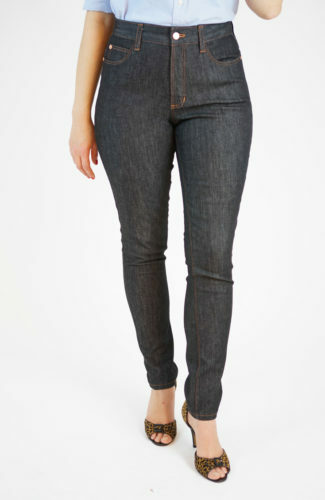 Finish your seams with either a flat fell or faux flat fell seam. 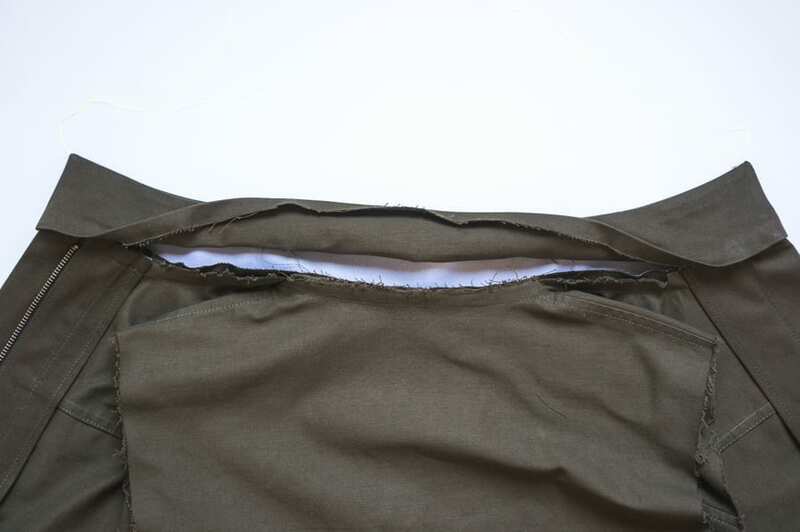 We prefer a flat fell seam in this area since the seam is visible when you are wearing your jacket with the hood down. Your three-piece hood is starting to take shape! Time to prepare the hood facing. We’re missing a picture here, so see the original instructions for guidance. The facings should be sewn right sides together at the short edge. 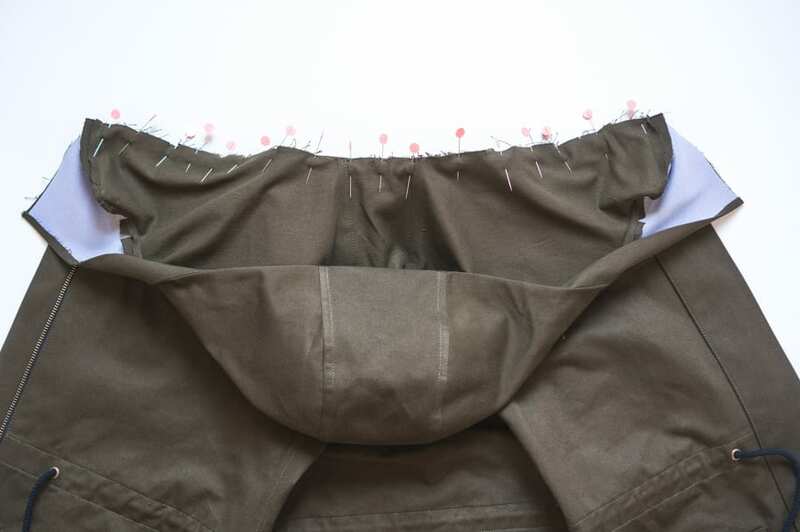 The long seam should then be folded and pressed under 1/4″. 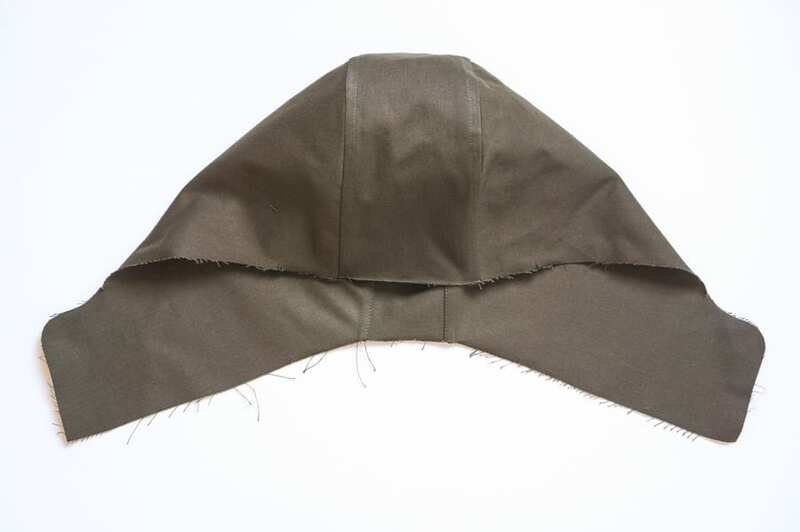 Once the hood facing is assembled, match the curved edge of the facing with the hood, right sides together. 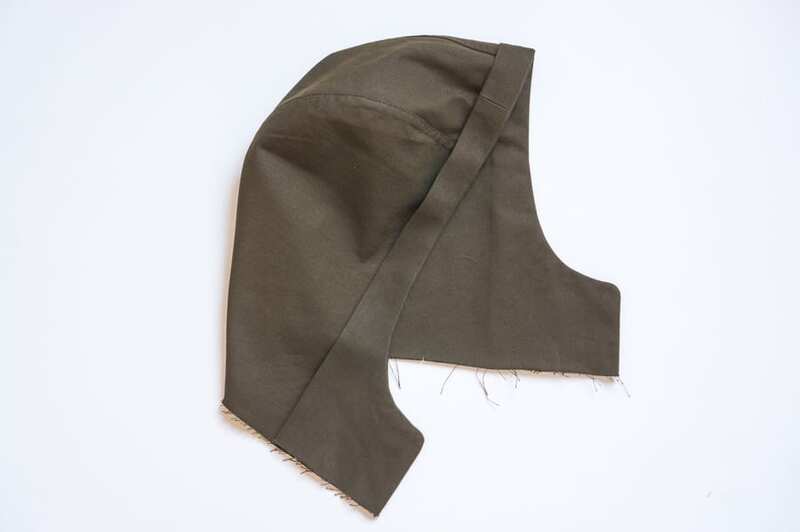 Stitch along the perimeter of the hood opening at 5/8″ and backstitch at each end. 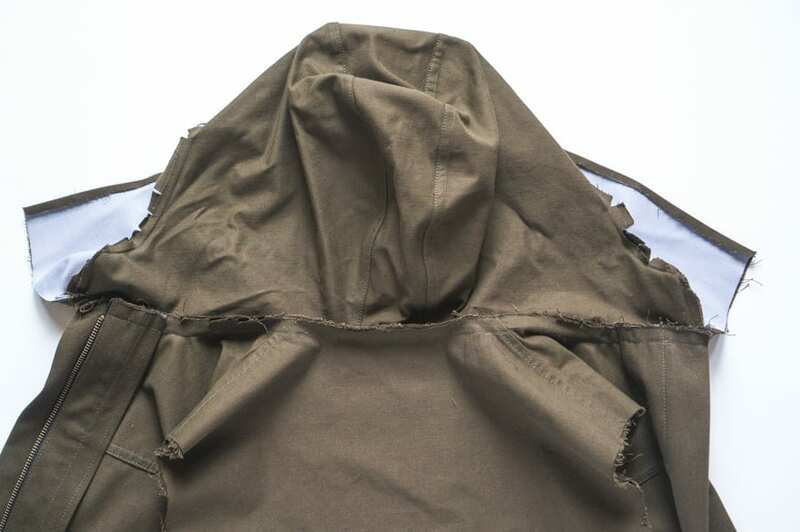 Grade the seam and clip or notch around the curve of the hood opening as necessary so that everything will lay flat when teh facing is turned to the inside of the hood. Press the facing so the seam rolls to the inside just stlightly. Now it’s time to attach the hood to the jacket. With right sides together, pin the hood to the jacket neckline, leaving the interfaced hood facing and seam allowance free on either side. 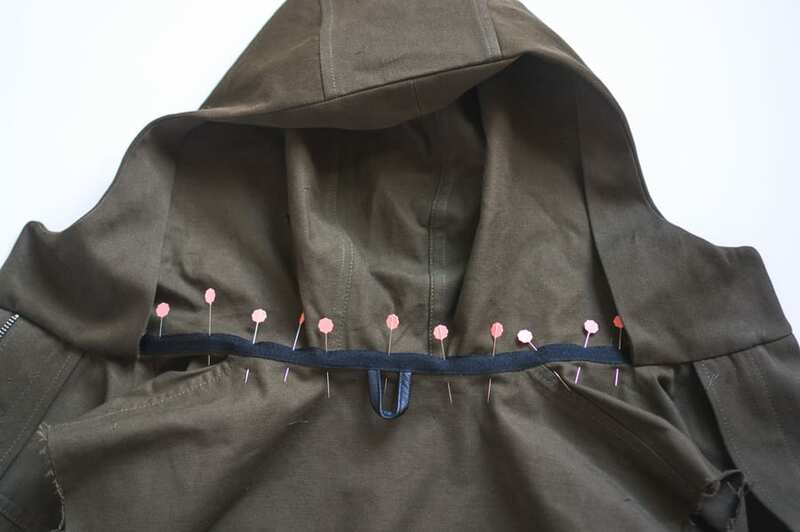 You may need to clip into the neckline of the jacket to help ease the neckline and hood together, but do not cut past the stay-stitching line you sewed earlier. 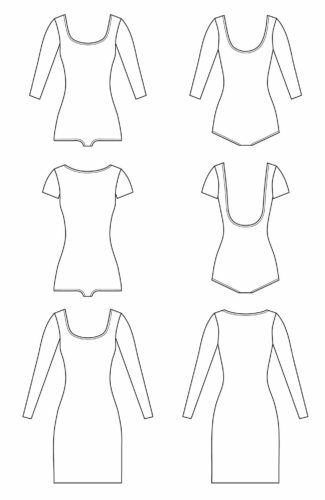 Sew along the entire neckline, backstitching at either end. 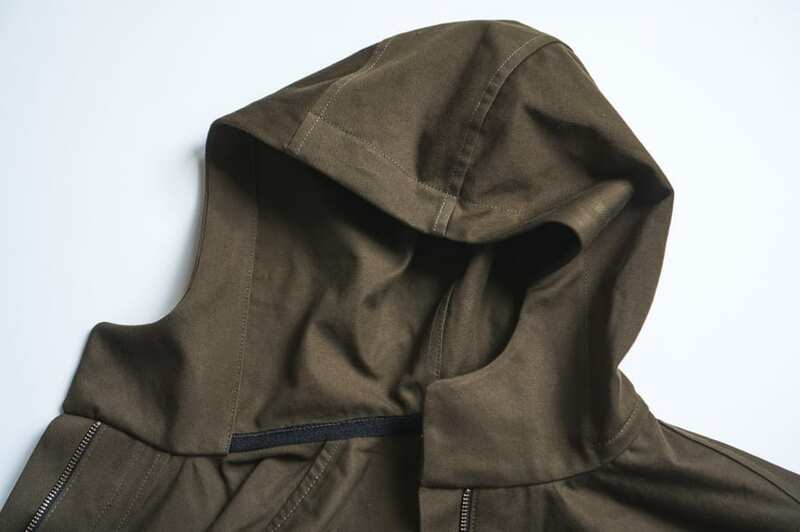 From the inside of the jacket, you can see that the right zipper placket and left zipper facing line up with either edge of the hood. 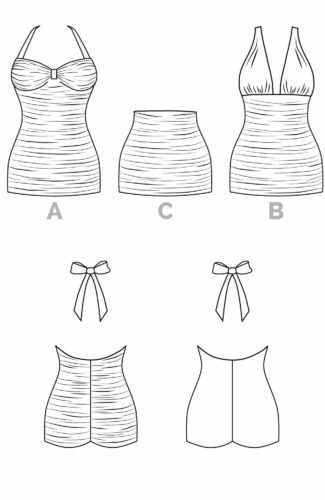 Press the seam allowance of the neckline up. 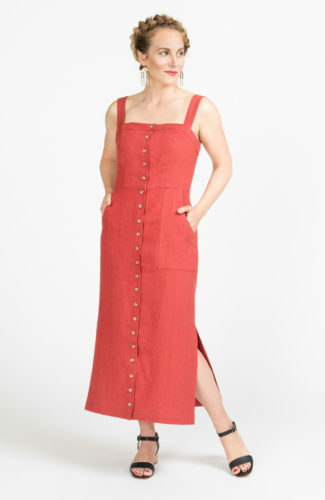 There are a few different options for finishing this neckline seam. 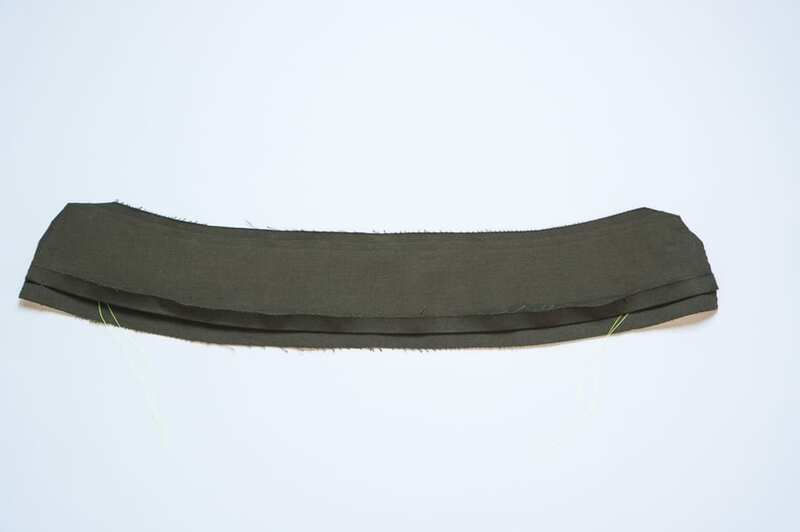 You can finish this raw edge either by serging or by covering it with bias tape, but in our sample, we finished our neckline with some black 12mm twill tape. We’ll show you how to the same below. 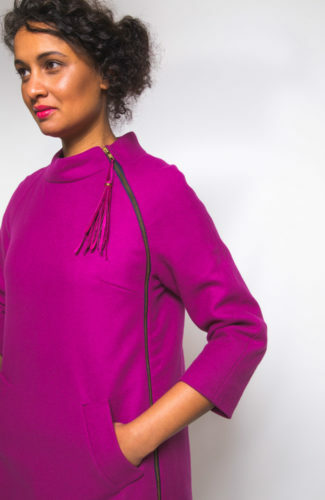 To add a hanging loop for your coat, center a loop of ribbon, chain or whatever you would like to use on the back neckline. We used a scrap of leather for our loop. 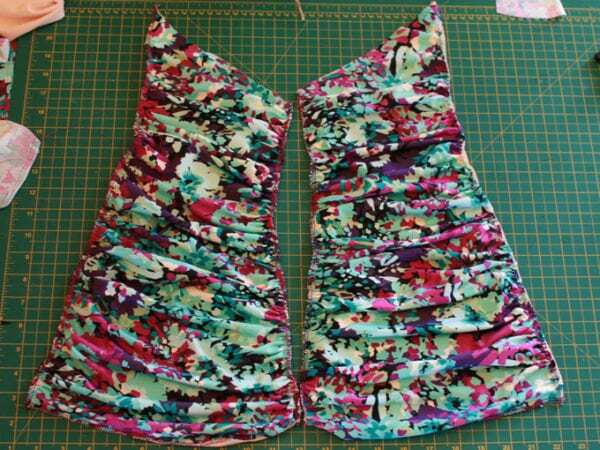 Sew the loop to the seam allowance only. 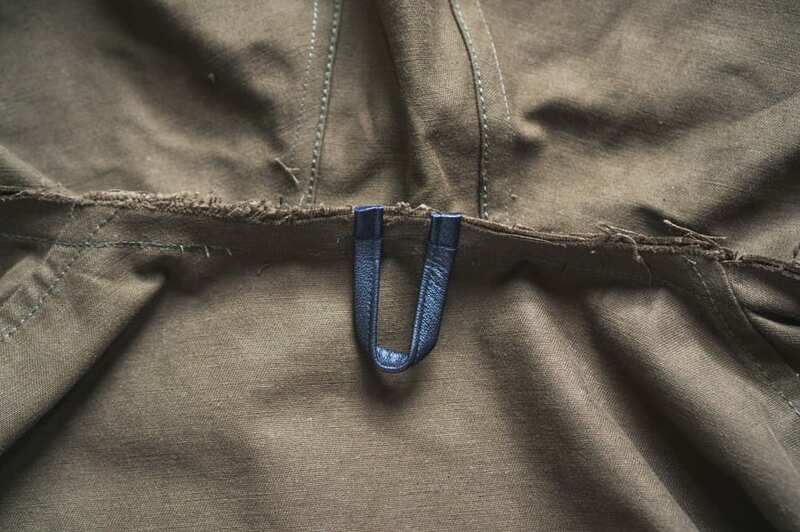 Using twill tape to finish this seam reinforces the neckline and secure the hanging loop in place. 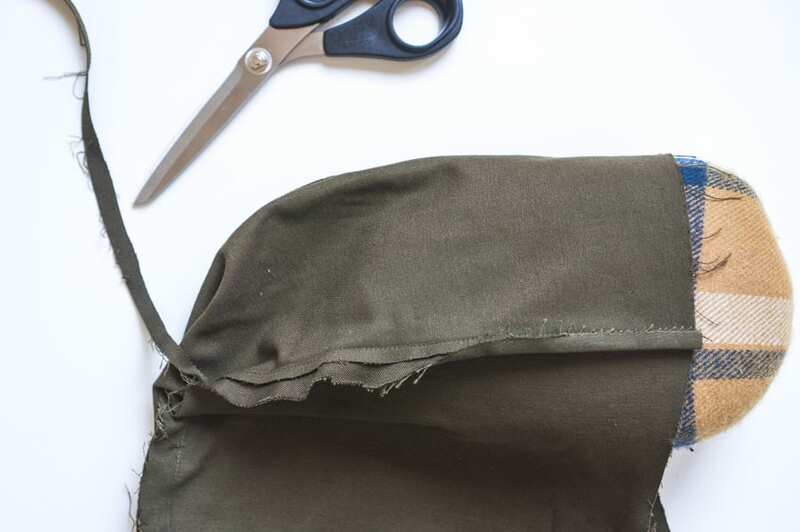 Since the hood facing will hide the first few inches of either side of the neckline, it’s not necessary to finish the entire raw edge of this seam allowance. 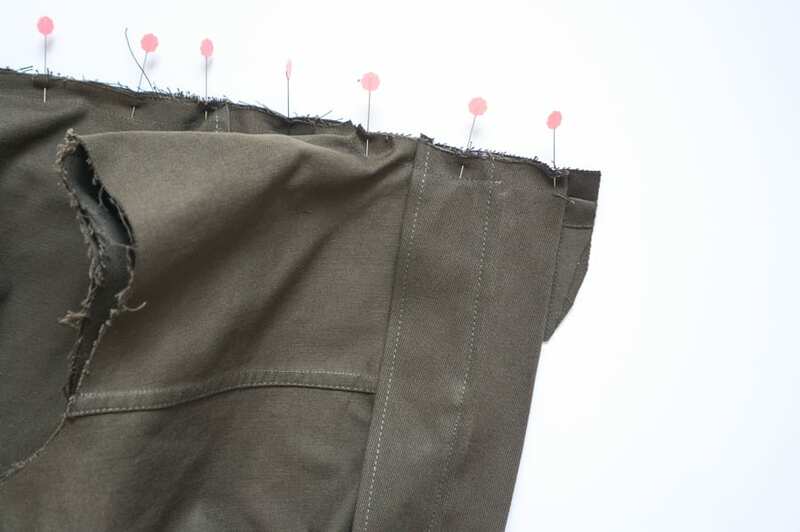 Pin the twill tape in place along the seam allowance of the neckline. 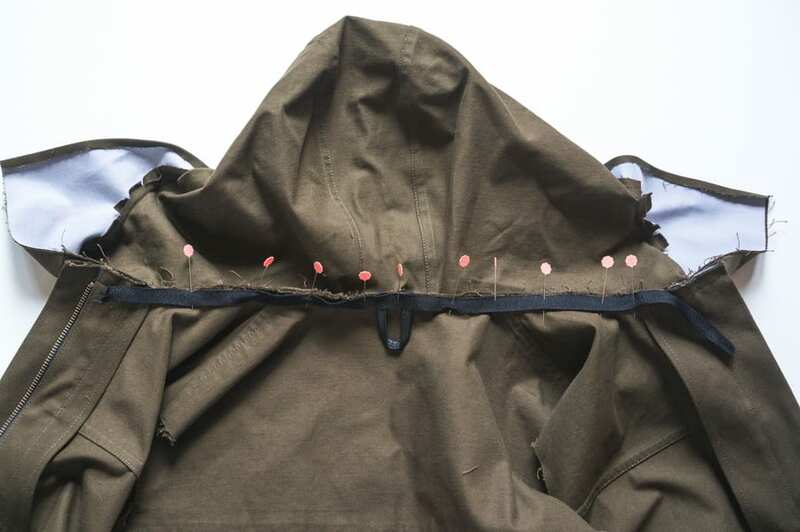 Starting from the right side of the jacket, stitch the twill tape to the seam allowance of the neckline, leaving the jacket and hood free. Our twill tape is black, so we switched to a matching black thread for this step. 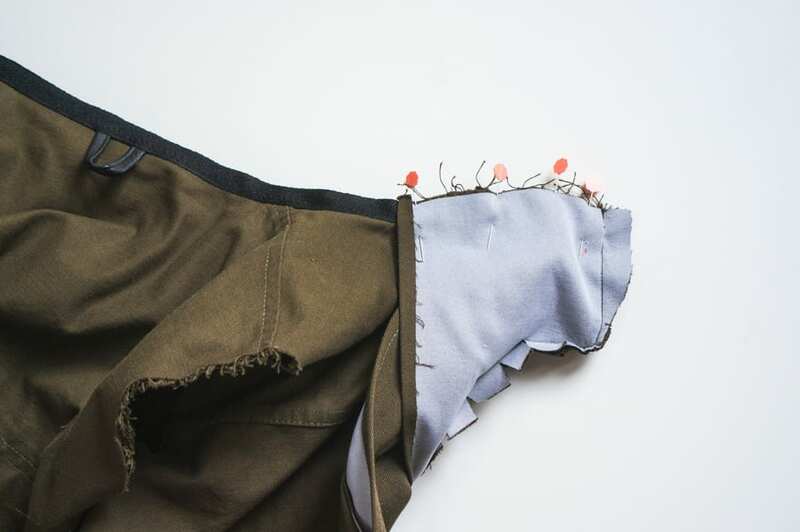 With an edge stitch foot, stitch as close as you can to the inside of the stitching you made when sewing the hood to the jacket. 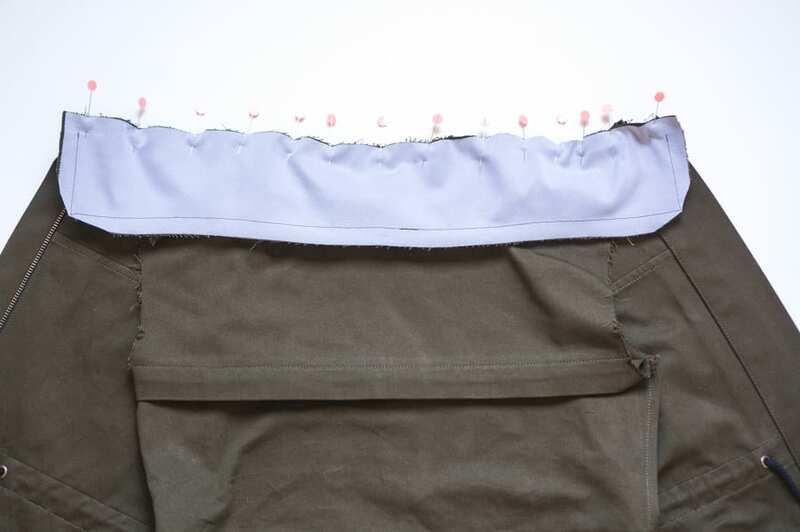 Trim any excess seam allowance or hanging loop ends that extend past the width of your twill tape. 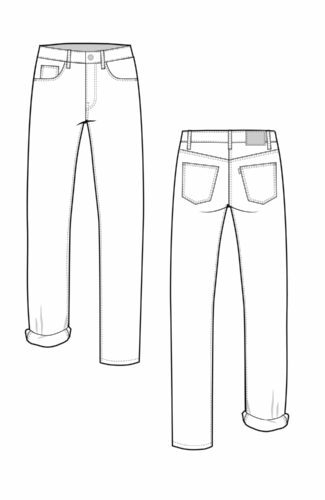 The next step is a bit like finishing a traditional collar stand when sewing on a shirt collar. Wrap the hood facing around the end of the neckline seam. 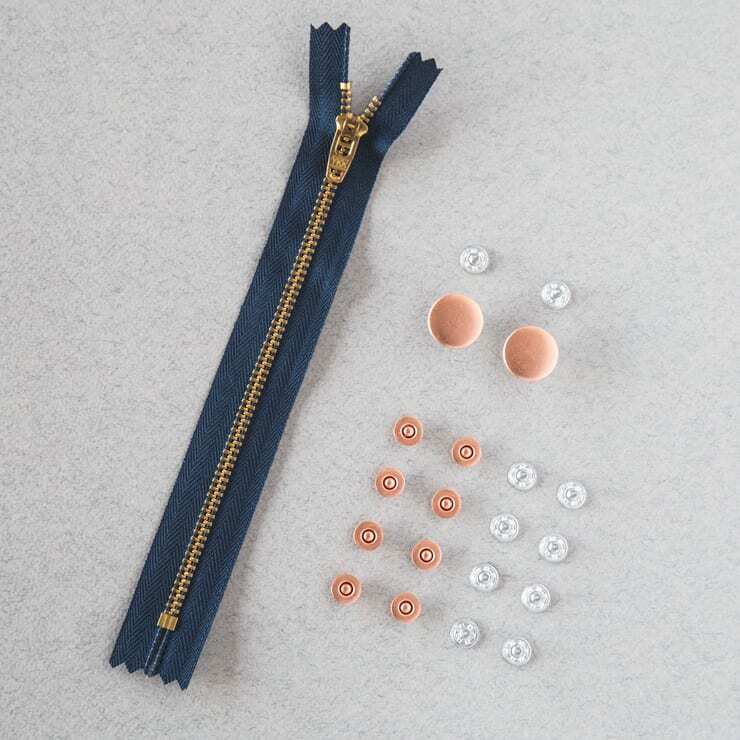 Keep the right zipper placket or left zipper facing flat along the seam as you roll it out of the way. The end of the jacket neckline will be sandwiched in between the outer hood and hood facing. Pin in place and make sure all the layers are nice and flat. 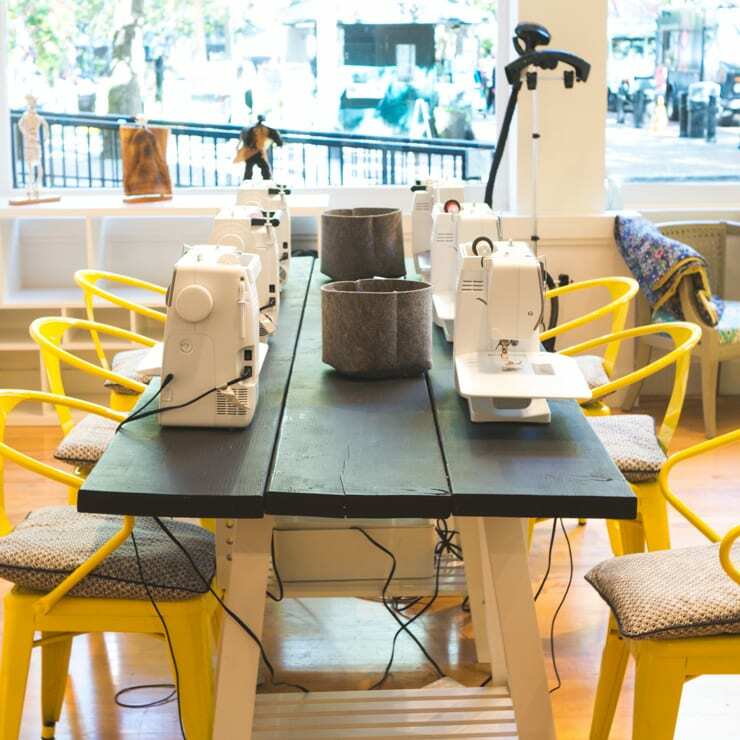 Sew along your original stitch line. Grade the seam and clip close to the corner. Turn the hood and hood facing right side out, and use a point turner to sharpen the corner where the hood meets the zipper facing. 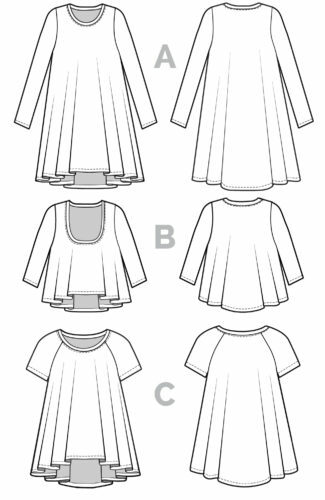 The facing should conceal the ends of the neckline seam allowance, whether you finished it with a serged stitch, bias tape, or twill tape. Pin the free edge of the twill tape in place along the neckline. 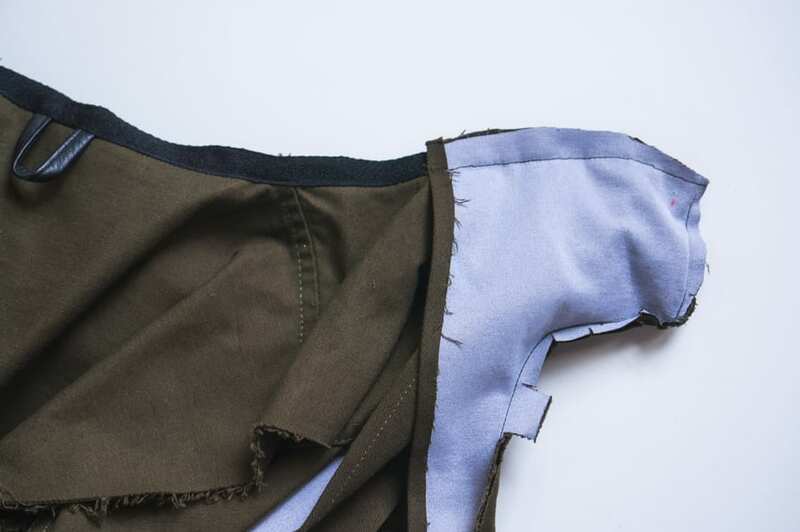 To secure the twill tape and seam allowance of the jacket neckline in place, sew along the free edge of the twill tape using an edge stitch foot. 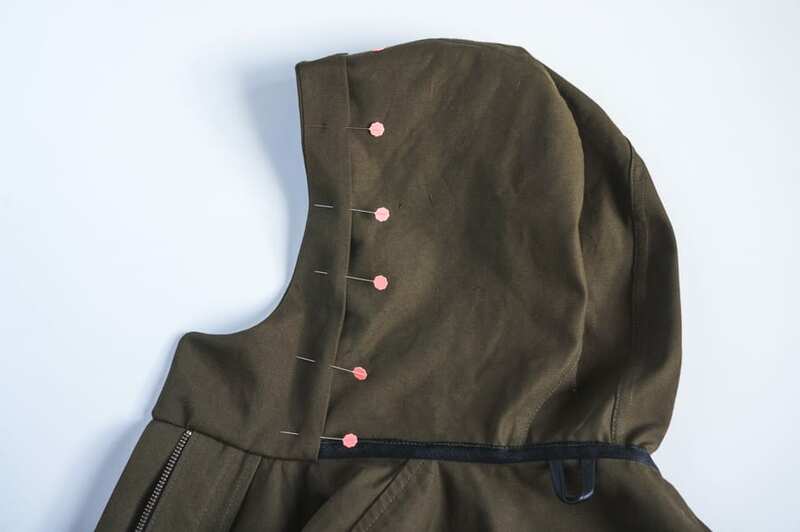 We want this stitching to start exactly where the hood facing covers this seam allowance, so we tucked our edge stitch foot under the facing to drop our needle precisely in this spot. 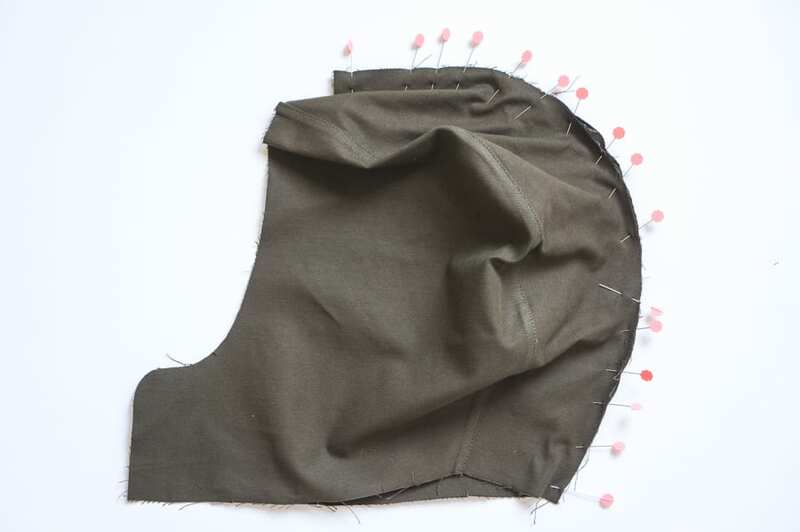 We used our green thread here so it would match the fabric from the outside of the jacket hood. The next step is to secure the hood facing in place. Pin the facing evenly around the edge of the hood. Topstitch all around the opening of the hood, catching the edge of the facing in your stitch line. Because we used the triple-stitch function on our Bernina, we actually did this topstitching from the inside of the hood, since the needle and bobbin sides of this stitch were equally attractive. This helped make sure the topstitching was catching the facing evenly all around the hood. 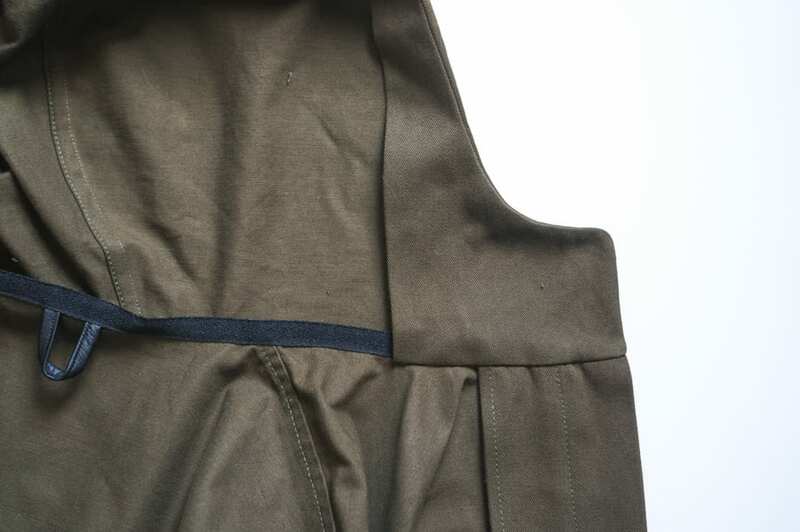 You can see where the hood facing topstitching lines up perfectly with the twill tape topstitching along the neckline. 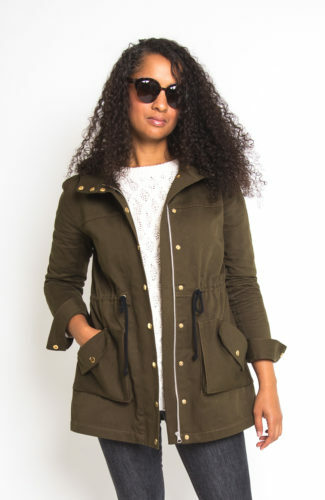 Your jacket now has a hood or collar! The next step is sewing the sleeves and sleeve cuffs!